Q1. What is the primary function of the default gateway? Answer: A. The primary function of the default gateway is to provide the capability to route between different subnets. Q2. What are some of the FHRPs that Cisco Nexus switches support? 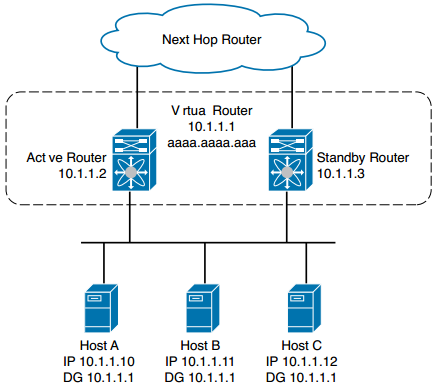 Answer: G. Cisco Nexus switches support HSRP and VRRP. Q3. What multicast address does HSRP leverage? Answer: A. HSRPv1 leverages the well-known multicast address of 224.0.0.2. Q4. What is the function of the coup message in HSRP? a. Coup messages are sent by the standby router when the router wishes to become the active router. b. Coup messages are sent by the active router when the router wishes to become the active router. c. Coup doesn’t exist in HSRP; it only exists in VRRP. d. Coup messages are sent by the active router when it no longer wants to be the active router. Answer: A. Coup messages are sent by the standby router when the router wishes to become the active router. Q5. What Cisco feature was introduced in a vPC environment to protect against thirdparty devices that cache the switch MAC address instead of the virtual MAC address? Answer: A. peer-gateway was added to protect against third-party devices.